Ten or more years ago, the majority of washing machines were fitted with two inlet pipes – one hot feed and one cold feed. The hot water needed to wash clothes was therefore typically drawn from the domestic boiler, and the cold water (for rinsing) taken from the mains water supply. Now it is virtually impossible to find a washing machine which is not fitted with just a cold feed. 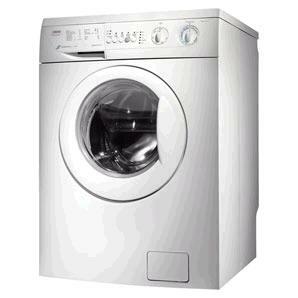 A standard cold feed only washing machine is connected directly to the mains water supply. When hot water is required during the washing cycle, it is heated inside the machine using electricity – in fact 85-90% of the electricity used by a washing machine goes in heating water. Even if you wash at 30 degrees, the washing machine still has to heat the mains water (typically arriving at the house below 10 degrees) by 20+ degrees. Washing machine manufacturers claim that cold feed only washing machines are 40% more efficient than the older style machines with both a hot feed and a cold feed. They say this is because modern washing machines use relatively little water (still 50 – 100 litres on average! ), the litres of cold water in the runs of copper pipe between the boiler and the washing machine would get into the machine via the hot feed still needing to be heated, and domestic boilers take time to heat up water (during which cool water will be fed into the washing machine). We are often asked whether or not it is possible to use solar heated water in a modern cold feed washing machine (or dishwasher) to save electricity. Unfortunately, the answer to that question is maybe. Sending renewably heated water into a washing machine in order to save electricity seems like a no-brainer, unfortunately things are never that simple. Washing machines are packed with complex electronics (see image of washing machine controller circuit above) and sensors which throw a wobbly when confronted with something out of the ordinary. A washing machine expects cold water to be fed into its cold feed, so how it will react if you send in 55 degree water (from a solar water heating panel) when it is set to do a 40 degree wash is anyone’s guess. It may run perfectly happily with the (overly) hot water, or it may throw up an error code and stop in mid-cycle. One thing is for certain – different washing machines from different manufacturers respond differently, and the only way to find out if you can pre-heat water before sending it into the cold feed is to try it yourself (or to find someone that already has). Note that do so may invalidate the warranty of the washing machine. Unless you want to boil all of your clothes and linen, you will manually have to ensure that the water being fed into the washing machine is colder than the temperature at which you want them to be washed. 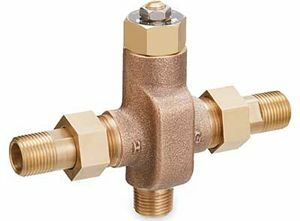 Thermostatic mixer taps are available which will do this for you (but they can be expensive). If you want to do a 40 degree wash, then you would set the mixing valve thermostat to 40 degrees, and it will automatically mix the necessary amount of cold mains water with your hot water to ensure that the water it sends into your washing machine is below 40 degrees. A second thing to consider is that a) it is better to rinse washing with cold water rather than hot, and b) it is a waste of hot water to use it to rinse washing anyway. Therefore, you either need to turn down the thermostat on the mixing valve or (better) completely block the hot water supply before it gets to the mixing valve when the washing cycle is finished. An electronic solenoid valve used in conjunction with a timer can automate this process cost effectively. You just need to use a power meter to measure the electricity consumption of your washing machine during different stages of its programmes to estimate the time when water heating is complete, and then programme that into a timer. It is a great pity that manufacturers have pretty much phased out production of washing machines with both cold and hot feeds since people with access to supplies of renewably heated water have to choose between purchasing a second hand (and therefore old and inefficient) washing machine with hot and cold feeds, or going to a lot of trouble and expense putting systems in place to enable them to use a cold feed only washing machine. * Should I buy a cold fill washing machine or a hot and cold fill? – this article is packed with information about cold fill washing machines, and their advantages and disadvantages compared to hot and cold fill washing machines. * What happened to the hot water valve in washing machines? The simple answer to this problem is to buy a twin tub washing machine. Our automatic gave up the ghost 2 years ago and my wife and I decided to try a twin tub. This means we can use hot water which has been heated by solar energy and wash the high temperature stuff first. Then rinse in cold water from our spring. Obviously this means having a wash day rather that the convenience of throwing things in an automatic when you wish. But all in all the cost savings are enormous. Twin tubs are still available new on ebay at comparable costs and are much simpler to maintain. Having just read your articles on using solar hot water in a cold feed washing machine I thought you may wish to know what we have done in the past. If we wanted a hot wash I would feed hot water into the washing machine via the powder drawer using a measured length of hose from the hot tap. Job done!! The window in the front loading door allows you to see how much you are putting in, and my opinion is that if there is a little too much, so what? When the wash is finished it will pump out until empty whether it holds 10 or 50 litres. Then the cold water rinse takes over as normal.